Shopping for large event items, such as Pipe and Drape can get pretty expensive. Between the heavy weight of the base and the extreme lengths of uprights, shipping costs can add up quickly. That is why we’ve put together this guide to show you how to work the system and get the most out of your order. We are a manufacturer, so think of us like Costco or The Home Depot, where we can give the best prices based on a wholesale model. Because we make the products ourselves and offer our best pricing upfront, there is not a whole lot of room for us to give discounts or mark our prices down. Our hardware, uprights, bases, and drape supports are manufactured for stock, meaning we make thousands at a time in a production run. Building in volume allows us to bring the unit cost down as it is amortized over the cost of production. 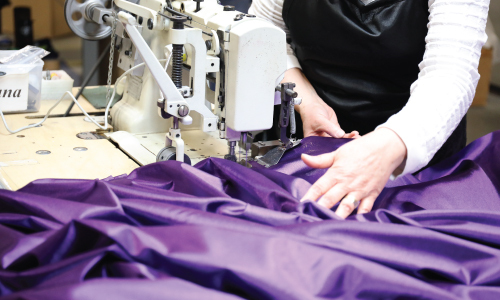 However, for drape, we make everything custom because every order is just a little bit different. We offer custom colors, hems, and even width. Whether you are buying one panel or five-hundred the set-up is the same: pull the fabric, slit it, and set it up on the cutting table, so we can offer an even better price for higher volumes. On our website, we offer two price levels: wholesale and regular. 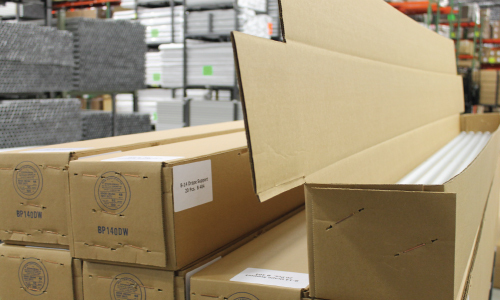 Bulk is always lower because we can pull full, pre-packed boxes off the shelves and ship them directly to you. For drape, we can offer a lower price for higher quantities because we can calculate the cost to set-up our equipment only once. We are open and honest with our prices. We don’t mark them up artificially and then slash them to make it look like a better deal. We are the manufacturer so we have the luxury of setting our prices based on the cost of making the item and giving you as many savings as we can. We are so confident in this that we offer a low-price guarantee. You can read more about it here. Even though we have super low prices, to begin with, we still try to offer sales. The best way to find out about our seasonal or show sales is to sign up for our emails or follow us on social media. You can sign up for our emails here. For even more deals, you should check out our clearance section, where we are always adding new products that are overstock, returned or have slight imperfections. It’s a great place to find a deal on something you need. While we have the best prices in the industry, shipping such large, heavy items can still hurt your wallet. The first thing to know about our shipping is that it is a separate line item on your receipt. We don’t build shipping into our costs like many companies do, so we aren’t able to offer “free shipping.” This works out a lot better for people looking to do local pickup or who are buying smaller/lighter items, which ships fairly inexpensively. The secret to getting a good shipping rate is to watch how large and the number of boxes are that you are getting. Shipping companies have started adding excess length charges to anything 96” or over, which means the standard 8ft uprights. You may consider buying the 5’-8’ telescoping upright for a little extra up front, but in the long run, you will be saving money because you don’t have to pay as much for shipping. So, you can get a nicer product with more height ranges for less than a fixed height upright. Another factor in shipping is weight. This one is super tricky because sometimes it costs more to ship heavy items and sometimes it costs less, depending on the size. Our products can be very heavy. If you are getting five 18” bases, that’s 175lbs, and five telescoping upright is about 30lbs. Where the confusing part comes in is that for smaller shipments more weight is bad, but for larger shipments, like a cart, more weight is good. The shipment companies like to get the most stuff in their trailers and as close to max weight as possible. They price based on density. The practical use of that knowledge is that if you are already paying for a pallet, adding more stuff to it, to maximize the space, won’t cost more. The same thing for a cart, you may as well fill it up and have it ship with products on it to save on shipping that product later. The final piece of the shipping puzzle is where you are shipping. If you are shipping to a commercial address, you will get a better rate than residential. If you are buying something large that requires a trailer to use a dock, it costs extra for a lift gate if your address doesn’t have dock access. A solution to this is if you can ship it to your company’s address rather than to your home, you will save some money. Shipping is always confusing and always changing, so we don’t expect you to be able to navigate it alone. We have representatives ready when you call in to help you and answer all of your questions. We also have a dedicated freight specialist who is always negotiating better rates and figuring out how to get you the best deal on shipping. Call us if you need help with your order, and we will be happy to figure out the best way to get you what you need at the best price AND the best shipping cost.